Recruitment Services | Mercan Canada Employment Philippines. Inc.
We at Mercan recognize that the heart and soul of a company is its people – the men and women who will contribute to its growth and development as well as provide a competitive edge over other industry players. 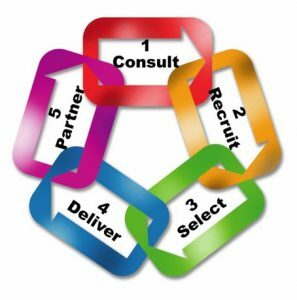 This process is initiated by Client-Partner consultation, where both parties will identify and analyze recruitment requirements. Based on this, Mercan Canada Employment Philippines will devise an action plan of customized solutions to meet the needs and goals of our Employer clients. On-line and browser based application and recruitment database system. This can be accessed by both applicants and employers through iquest.mercanph.com. It keeps track of both applicant’s information and employer’s information, e.g. recruitment history. Mercan Canada Employment Philippines places job postings in popular online job-boards as well as Government sponsored online job-boards and job banks. We advertise in select major broadsheets and publications widely read by target applicants. We deploy a distinctive advertising style that highlights job opportunities & needed key competencies. Mercan Canada Employment Philippines actively participates in Jobs Fairs in many major cities where we operate. Mercan Canada Employment Philippines sits down with Employer clients and analyze the job vacancies in their company. Mercan Canada Employment Philippines then devises customized job assessment tools and selection procedures for assessments. Qualified applicants are given further relevant skills verification tests, to validate the degree of their technical aptitude. Employers, at their discretion, may require competency tests or exams to be conducted by Mercan. In addition, the candidate's language proficiency is assessed to ensure they can properly function at their work place. We have several partnerships and collaborations with different prestigious training and testing centers both private and government; Technical Education and Skills Development Authority (TESDA), Philippine Nursing Association (PNA), Occupational Health Nursing Association of the Philippines (OHNAP), Meralco Foundation Institute (MFI), Center for Culinary Arts (CCA), Center for Hospitality Arts Management Philippines (CHAMP), Construction and Manpower Development Corp. (CMDC), and Philippine Welding Society (PWS). Mercan has numerous experiences in arranging individual or group interviews of Candidates. Our interview process includes Behavioral Based Interviewing techniques, which allow us to determine the strengths and weaknesses of individual candidates in relation to the specific competencies most critical to the Client’s organization. Mercan can arrange either thru video conferencing technology using POLYCOM equipment or face-to-face interviews in any location; Mercan will arrange hotel and transportation logistics for employer. We conduct all work reference reviews and provide our Clients with resumes and supporting documents of pre-screened, qualified foreign workers for their final review and decision. Candidate profiles are submitted to the employer with complete presentations detailing the specific aspects that qualify them to the vacant posts. Once the employers have made a decision to pursue a particular applicant, a complete andn comprehensive referencing process will be undertaken to confirm his/her skills and abilities. Mercan can deliver customized training and skill competency development lessons or courses to develop trainings and curriculum to enhance the skills and competencies of foreign workers for the Canadian market. Mercan has developed a partnership with Technical Education and Skills Development Authority (TESDA) the Philippine Government training and skill competency development body to develop trainings and curriculum to enhance the skills and competencies of Filipino workers. This will enable the workers to develop competencies and qualifications critical to the requirements of the Canadian employers. With this strategy, Mercan can ensure that the worker’s familiarity with the Canadian standards prior to their arrival. Furthermore, Mercan Canada Employment Philippines is authorized to use the training facilities of TESDA which are strategically located all around the country to make these trainings accessible to the workers. With this unique partnership with TESDA (www.tesda.gov.ph), we can provide a reformed industry-based training program that includes apprenticeship, a dual training system and certification programs for foreign employers. Mercan discusses the vacancy with all appropriate candidates before a final shortlist is submitted. Candidates will only be forwarded to employers if they have demonstrated a genuine interest in the position. The employers then give their final decision and provide with the list of their selected candidates. Mercan will then start the processing of employment and emigration/immigration documents. Mercan will support the employer and the employee in every way to facilitate the speedy processing of the application at the embassy of the country of employment. Mercan will provide regular reports to our clients to monitor the progress of the workers application. There will be no extra cost to the client for these reports. Processing Exit Clearances in country of origin. Mercan will coordinate with Employer the purchasing of airline tickets and deployment advice for selected workers either through email communications or direct phone communications. Workers are provided with a pre-departure orientation which prepares them for the living conditions and societal norms of Canada to allow these workers to better adjust and adapt into their new society. Our settlement service includes immediate application for Social Insurance, Health Care and Bank Accounts. Developing a community support plan specific to the area and region the foreign worker is employed. Mercan understands that the foreign workers will need help in adapting into the countries they will be assigned. As such, Mercan and the Employer may work together in providing recruited foreign workers guidance, supervision and assistance for an uncomplicated settlement in their new communities and host country. Measure the success of the organization’s programs through employee survey. Mercan will monitor processing timelines and inform the Employer and foreign workers as to when they should start work permit renewal process if applicable.